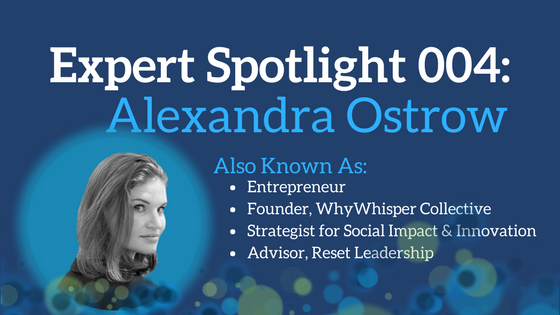 Alexandra Ostrow is the founder of WhyWhisper Collective, a strategy firm that focuses on helping clients to build approached to better the world. A leader of the firm, Alex empowers innovative business and nonprofit leaders to address social, economic, and environmental issues through strategy, planning, and project management. WhyWhisper Collective’s dedication to corporate social responsibility is impressive and inspiring. They pledge 5% of annual profits to charities, volunteer quarterly, consult clients to embrace CSR, and are a celebrated B Corp recognized as a “Best for community honoree” and in the 2015 “Best for NYC” awards. We love the message and mission that WhyWhisper Collective asks us to contemplate. We’re proud to know this wonderful company, and excited to see just how much impact that roar will have! Alex shares her inspiring impact journey in our Impactful Insights video series. Check out her story and what she’s shared with Impact U on her expert page, here.